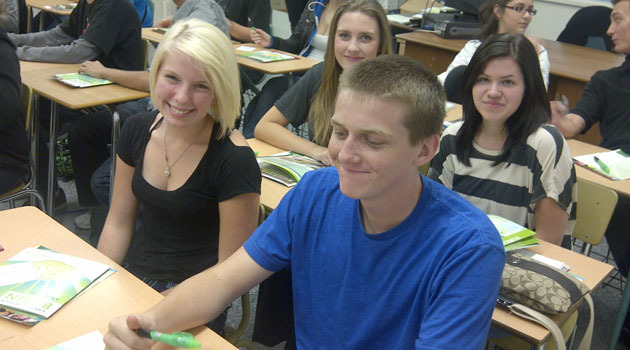 Langley Secondary Grade 12 students Dylan, Natashya, Erica and Jacqueline are eyeing UFV for next year. More than 1,000 high school students came to check out what UFV student recruiter Daniel Goertz had to say during week one of the annual Post-secondary Institutes of BC (PSIBC) tour. The tour is a coordinated effort by universities, colleges and institutes to visit high schools together, making it easy for Grade 12 students to find out more about their higher education options all at once. Reaching students from 17 high schools across Chilliwack, Abbotsford, Hope, Agassiz, Yale and Langley over the first four days of the tour September 26-29, Daniel, with assistance from UFV alumna Karli Menagh, connected with students and parents through presentations and mini-fairs. They also gave out copies of UFV’s Caring for your Brain: A Handy Guide viewbook, application forms, and fun swag to remember us by. 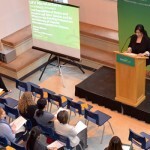 With demand for UFV’s programs at an all-time high, Daniel encouraged the prospective students to apply early, and to meet all the entrance requirements, in order to avoid disappointment. UFV began accepting applications for the Fall 2012 semester on October 1. For more information, contact Daniel at info@ufv.ca. 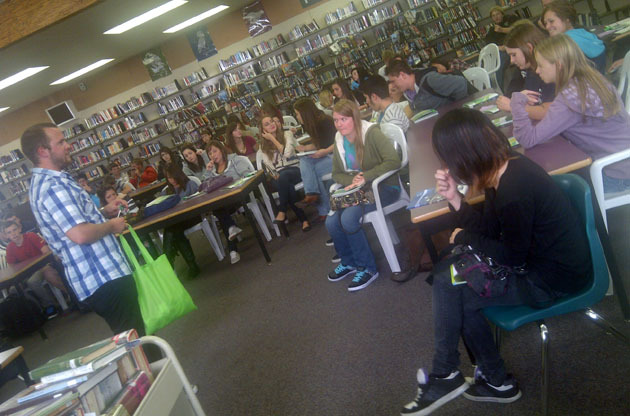 UFV student recruiter Daniel Goertz talks to students at Chilliwack Senior Secondary. Great to see our recruiters getting in some face-to-face time with students. Our world is changing and students will require more than a grade 12 education to reach their full potential.